I didn't buy these but I got the Christmas best sellers in the mail today. The story of overcoming seemingly insurmountable obstacles with romance and thrilling plot twist to keep you hanging on the edge of your chair. Two definite page turners. Seriously though, browsing through the books (and having spent a bit of time with their application), these changes in how to represent the Rules should've been done years ago. 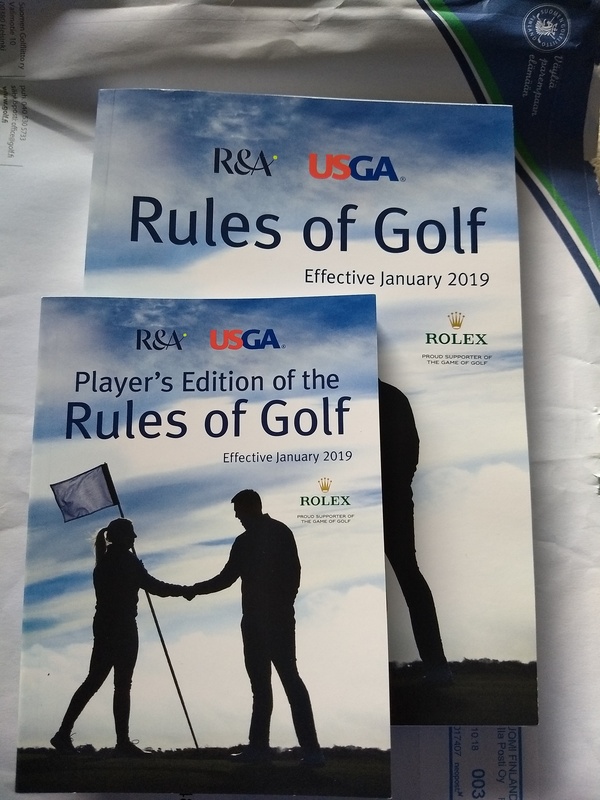 The language used and the illustrations make the rule books much more approachable and user friendly. Just bought a new set of JPX 900 Hot Metal to replace my ageing Taylormade irons. Read that the new 919 variants weren't that different (mainly cosmetic) and saved myself £400 as a result. Have to say they are really good irons and have already made a difference. Long may it continue. Ordered a set of S18 wedges in black. Waiting for them to appear. Was tempted by the 919 Tours but am sticking with my MP5's so getting them regripped and loft and lie checked. Only problem is it might be a wee while as I've not played any golf over the past 8 weeks due to a dodgy arthritic knee and the crap weather...! I also bought a couple hats. I've worn my Mizuno hats outside working in the yard while I couldn't play golf and all of a sudden last Monday, I realized I didn't have anything really clean. Like I mentioned above, I'm going to empty the 3 shelves in my closet that are filled with every manner of golf related stuff. Certain things like spare headcovers or a bag with about 1000 tees in it don't need to go back. They can go on a shelf in the garage. What I'm concerned about it grips. I usually change mine about every 6 months and I want a spare set in reserve all the time, so I suspect I'll need to buy those next. I just bought a new Mizuno umbrella today. I love the simple fact it's white instead of the usual black color every other brand has. Hapy new year to you too... Nothing but fairways & greens for 2019. Actually, I don't play in the rain. Sorry to sound conceited about it, but I could play 350 days a year if I had enough people to join me, so to me, an umbrella or rain suit is a piece of equipment intended for temporary use until I can get of the course if it rains while I'm playing. There is one thing about the Mizuno umbrella being white though. Some people keep on playing and when you are standing under trees with a black umbrella, you often find that people will hit into you without seeing you. The white umbrella definitely stands out a lot more and at the least, they will yell or be more careful. Not conceited at all Dennis - If someone could put a roof over the UK I'd never play in the rain either! I've heard of fairways... I haven't seen many, so I'm not sure how many truly exist on this side of the pond. Not a purchase, but recently acquired a 58 degree T7 wedge as a birthday present to round out the set. Had its first round on Monday and it worked a treat. It's sad that Mizuno have stopped making the T7s. They're by a mile the best, and best looking, wedges they've made for decades. If only they ditched the blue and offered them in the grey colour they used to years ago. Oh please not, I love the blue. I would just like more choice for everyone, like with the S18 right now. Silver, Black and Blue seems like a good Portfolio to choose from, so that everyone can be happy!